Metro Tray Slides help organize your trays and totes. 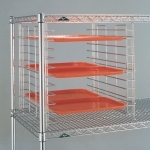 Metro tray slides can be used on Super Erecta, Super Adjustable, Metromaxi and Metromaxq shelving. Additionally wire shelf accessories compliment your shelving and carts. From casters, shelf ledges, shelf dividers to plastic split sleeves, hanger rails and handles. Metro has the accessory to fit your need. Tray slides free up shelves for more efficient use of space. Free up shelves for more efficient use of space. Available in chrome and Metroseal 3 finish. These slides can be spaced to fit any width container or tote box. A super space-saving solution. Using Super Erecta wire units 21″ or 24″ (530 and 610mm) wide, tote boxes and this innovative slide system, you have the flexibility to create a custom configuration that can be positioned quickly on new or existing units without the use of tools. Finish is nickel-chrome wire with clear protective coating. A super space-saving solution. Using Super Erecta wire units 21" or 24" (530 and 610mm) wide, tote boxes and this innovative slide system, you have the flexibility to create a custom configuration that can be positioned quickly on new or existing units without the use of tools. Finish is nickel-chrome wire with clear protective coating.